You are invited to share in the fun for this popular event on Friday, October 5 from 6:30 to 9:00 pm at the San Javier Marina Hospital. We kick off each October with our Pink Wave Cocktail! Join us for some sweet and savory nosh, pink lemonade or pink cocktail along with some absolutely amazing raffle prizes as we kick off October! For men and women! This is a no charge event and no RSVP is necessary. We will honor our breast cancer survivors, honor those who have passed and promote awareness of the disease. We will transform the lobby of Hospital San Javier Marina into a lovely, pink lounge! October 11, 2018 11:00 am Location: Diagnosti-K Francisco Villa #1389. Please join us as Dr. Guillermo Ramos (plastic surgeon) and Dra. Claudia de Moral (breast imaging specialist) speak on “Breast Health”. They will cover all aspects of breasts, from mammograms, ultrasounds, breast cancer diagnosis, self-breast exams, what is 2D Tomosynthesis and as well, the various types of breast surgeries, from implants to reductions, reconstruction to breast lifts. This will be a very informative and interesting event. No charge. RSVP please as space is limited! Bring a friend! *This will be repeated in Spanish on October 25, 2018! Join us on October 18, 2018 from 6:00 pm til 9:00 pm. If you have never been to Lujo in Bucerias, definitely a must-do! An eclectic shop, filled with all types of treasures and little luxuries! Join us as we celebrate October’s Breast Cancer Awareness Month with some canapes, a glass of wine and good chatter. 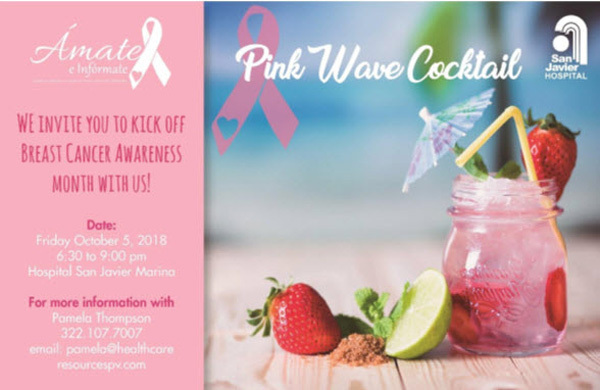 For those of you in the northern part of the bay who cannot attend our Pink Cocktail on October 5 in Vallarta due to distance, we have created this event just for you! Special pink prizes! No charge event. Have a peek at the place: Lugo Lifestyle, #500 Lazaro Cardenas, Bucerias. We look forward to seeing our northern bay folks! On Sunday, October 28, 2018 at 10:00 am attend our Pink Brunch at Bravos! Francisco I. Madero #263, Col. E. Zapata. Enjoy a lovely Sunday morning as we close out our month of events! In addition, we will have a fashion show by La Sirena Reina, quality swimwear for women of all sizes! Men are welcome of course! Michael (Bravos) has put together a scrumptious menu. Cost: 250 pesos includes gratuity. Space is limited so RSVP mandatory! We celebrate our breast cancer survivors each year! These events will fill very quickly so RSVP to me as soon as possible. We encourage you to support the businesses as they promote and participate in our October Awareness Month! Pamela Thompson, Healthcare Resources Puerto Vallarta, pamela@healthcareresourcespv.com.